Our New Cup Guard Pirate Cutlass includes a scabbard with cast chromed features and an embossed cup hilt.. Length: 30" Weight: 3 lb, Chrome Finish Accents with Embossed Cup Hilt. Our New Cup Guard Pirate Sabre Includes a scabbard with cast “brass” features and an embossed cup hilt. Features; Length: 37.5", Weight: 4 lbs, Antiqued Brass Finish Accents with Embossed Cup Hilt. This sleek Saint Jorge Sabre Replica features antiqued brass finished furniture, Comes with s scabbard and has a 35” blade. Features; Overall Length: 38.5", Blade Length: 35", Weight: 3.4 lbs with Antiqued Brass Accents. Our Beautifully Replicated Hilt Pirate Cutlass is 30 inches long and weighs 3 Lbs. 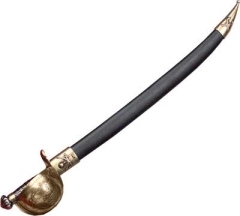 It includes an Elaborate Scabbard with cast Brass features. Our Beautifully Replicated Hilt Pirate Sword is 37.5 inches long and weighs 4 Lbs. It includes an Elaborate Scabbard with cast Chromed features. Our Beautifully Replicated Hilt Pirate Scimitar is 30 inches long and weighs 3 Lbs. The Detail of this is amazing. Our Beautifully Replicated D-Guard Pirate Cutlass is 30” Long, Weighs 3 lbs and Includes a Scabbard with cast metal skull fob.